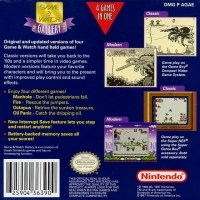 Box Text: Original and updated versions of four Game & Watch hand held games! Classic versions will take you back to the '80s and a simpler time in video games. Modern versions feature your favorite characters and wil lbring you to the present with improved play control and sound effects. Enjoy four different games! Manhole - Don't let the pedestrians fall. Fire - Rescue the jumpers. Octopus - Retrive the sunken treasure. Oil Panic - Catch the dripping oil. New Interrupt Save feature lets you stop and restart anytime! Battery-backed memory saves all your scores! 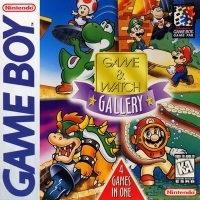 This is a list of VGCollect users who have Game & Watch Gallery in their Collection. This is a list of VGCollect users who have Game & Watch Gallery in their Sell List. 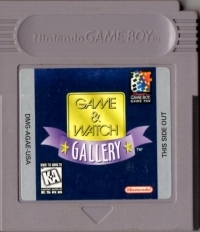 This is a list of VGCollect users who have Game & Watch Gallery in their Wish List.